Priya Village Roadshow (PVR) Cinemas is one of the cinema chains in India. The Company, which began as a joint venture agreement between Priya Exhibitors Private Limited and Village Roadshow Limited in 1995 with 60:40 ratio, began its commercial operations in June 1997 with the launch of PVR Anupam in Saket, India's first multiplex. Priya Exhibitors were the owners of the Priya theatre in Basant Lok Market, and they acquired Anupam Theatre in Saket and under PVR launched a multiplex. Currently PVR controls 398 screens in 93 locations across 38 Indian Cities. 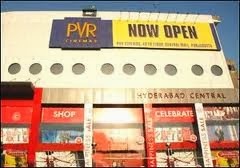 PVR Hyderabad has running with 5 Screens.